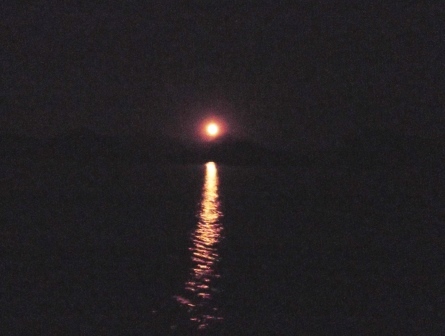 Having promised another episode of our life aboard Alixora to several people who have been impatient for an update, tonight (Friday 10th May) seemed a good time to start with more added the following Tuesday. 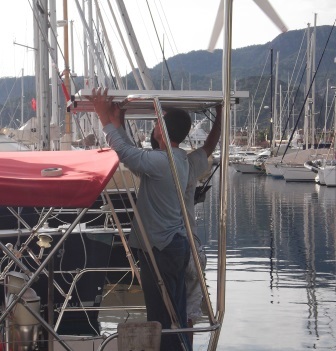 We have been in Netsel Marina, Marmaris for the past week organising to have a gantry and solar panels installed. This has been in our plans for a while, and finally it seemed like a good opportunity. While cruising we have had to run the engine for an hour or so every day to top up the batteries if we are at anchor or in a harbour where there is no electricity available from the shore. This is mainly so that we can keep the fridge running, although use of computers and lighting contributes to the electricity use. The noise and heat generated by the engine is a nuisance, it also uses up diesel and is not particularly environmentally friendly. The only benefit is that it heats up our hot water tank! I think we can manage without that. By the time I finish this blog and publish it I should be able to include pictures of the new installation. 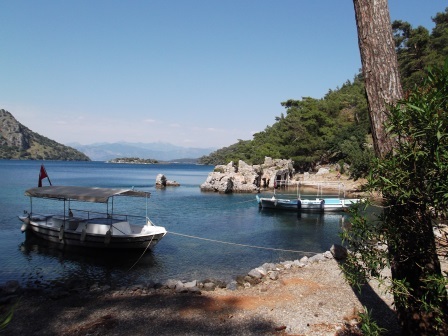 Meantime we have been busy preparing to leave Kas and then mooching about in the lovely bays of Gocek and Fethiye. Our replacement cups for the wind instrument were delivered by our kind friends Graham and Vicky. Graham also supplied a piece of 2mm stainless rod that I had spent a fruitless morning searching for in the shops in Kas! He just “happened” to have it lying around…. So Brian spent a happy day working on repairing the broken casing, making the rod so that it wouldn’t fall out, and then fixing the cups to it, with a couple of failsafe bits to fasten them in place. He tested it out taped to the back of the boat, then it was time to send me up the mast again with all the bits to put it back on. It was no exception that muscles were aching and bruised for the next few days! 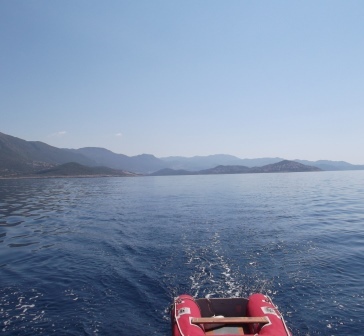 Another trip to Fethiye was organised with the dinghy in the back of the car as we had decided to get a cover made for it as the inflated bits have started to become degraded with UV damage. Graham had recommended a particular company in Fethiye. They gave us a reasonable price and said it would be ready in a week. 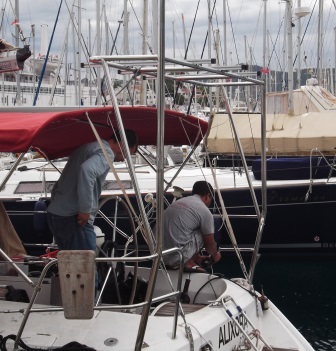 The same trip (staying in the very pleasant Yacht Classic hotel again – the building work had progressed significantly), covered getting some new anchor chain in Gocek. 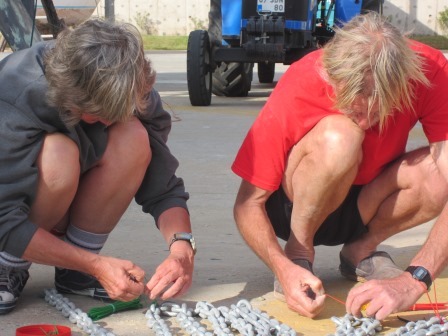 We have been prevented from anchoring in some bays because the depth was too great for our 58 metres of chain. The accepted ratio is to let out chain to at least 4 times the depth of water. 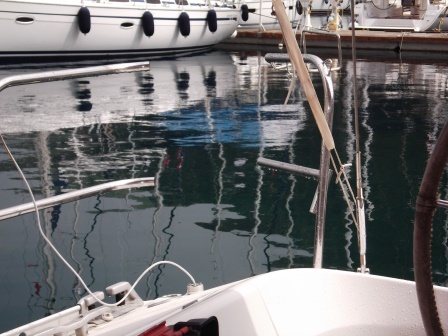 This has limited us to anchoring in 12 metres or less – with a margin for safety. When we anchor and tie a line to the shore which is a common feature in Turkey, the seabed often shelves very steeply so the anchor might sit in 16 metres or more. So we bought 60 metres of new chain and have added the best 20 metres of the old chain to give us a bit more flexibility. An unexpected side effect is that Alixora is now rather nose heavy! The old anchor and some of the old chain remains on board waiting for a solution for where to keep it or how it might be used…..
On the same trip we acquired a pile of different sorts of insulation – some for adding to that around the hot water tank, other for replacing the ancient foam that insulates the engine compartment for both noise and heat (this being a task that Brian has started while we sit in Marmaris). Another major find was reels of LED lighting strip at an amazingly cheap price, and some nice small switches that could be embedded in the plastic ceiling panels. We now have much better and more efficient internal lighting (although it is a bit harsh as the shop didn’t have “soft white” strip). This will be great, not only for saving power saving, but also so that we can work longer in the evenings in winter. The existing lighting was just not sufficient to be able to do things like electronics or sewing in the dark. We are now using the LED lighting almost exclusively! On the insulation front, I had suggested that the things they were selling in the supermarket to put against your car windscreen to keep the sun out (bubblewrap sandwiched in a silver and a printed thin plastic sheet) might be a solution for the small gaps in our cabin ceiling between the plastic and wooden panelling and other ceiling and window areas. With one as a sample, we found that it would work very well. So I was sent off to raid the supermarket – they didn’t seem to turn a hair when I walked out with 8 of these things! I had to be careful to get the right design – Brian needed the ones with dolphins on for the window shades that are visible! Alixora is now a bit better insulated against the heat of summer sun. And most of that was still in March! The beginning of April continued with the gales and unsettled weather that we had put up with for the past month but the temperatures started to rise quite quickly. I had a lovely day for my birthday, a great lunch out with Jeri and Gill at Halil’s Ottoman restaurant where he had set a special table with flowers, and a visit to the market where I found a replacement shoulder bag that I had been searching for for a while. Gill bought me a lovely scarf, and Jeri paid for my lunch. What treats! On the return trip a few days after that to get the dinghy and its very smart new cover I managed to pick up a speeding ticket – oops! Then I had to find the town hall in Kas to pay it (25% discount if it is paid within 2 weeks) which was a new experience. John and Gill had taken over the flat we had vacated, and entertained a few times, inviting yachties who were slowly returning to get their boats ready for spring and summer sailing. We enjoyed the social scene and Gill produced great food as well. However it was a bit disconcerting to have “people” around in “our” marina where we had had sole occupancy for the winter! Thor and Thorhild on Tayana had us round for dinner one night as well – a very good Norwegian meal of lamb and cabbage, with a special custard and raisin pudding. 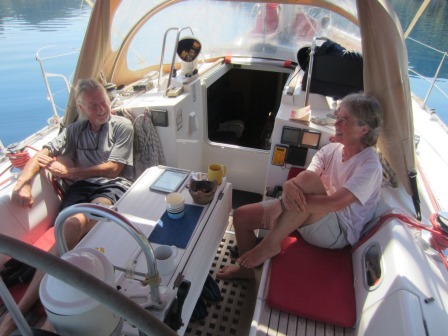 We toured their lovely boat – surprisingly not much more room than ours but very cosy. Our friends Lydia and Neil arrived back in mid April to find that their boat Silver Lady (on the hard standing) had filled up with rainwater – absolutely horrific. They spent the next days and weeks cleaning it out, rescuing what could be salvaged, getting the oily water pumped out and negotiating with the insurance company and surveyors to sort out what recompense and work had to be done. Their boat is their only residence, so are having a very hard time and we all felt really sorry for them. John helped us to get a new roller made for the back of the boat which is really for a rear anchor. We use it mostly as a pulley for lifting the outboard engine on and off, but it has been used for its intended purpose once I think! Having succeeded in this venture we saw that the front roller for the main anchor was very worn, so went and got a new one of those made too. The wonders of local engineering shops. That makes our anchoring system almost new throughout – a new windlass two years ago, new anchor last year, new chain and roller now. 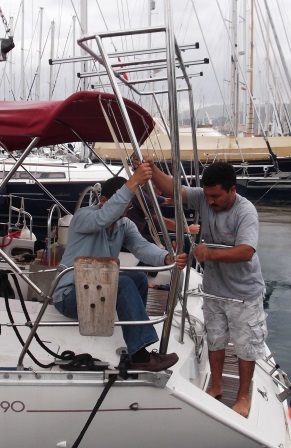 While we have been in Marmaris Brian has worked on the windlass too as it had become very stiff to operate. All fixed now. The Sunday walks, that we had missed while Alixora was out of the water, came to an end as the leaders were contracted for commercial expeditions. 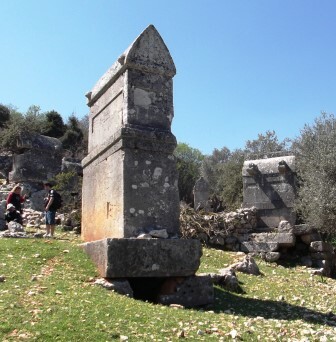 One day we went to Apollonia then down to Kekova bay via Apelai, then the last one on a very windy day in April in the Fethiye area, along the start of the Lycian way, only backwards! We walked past an enormous landslide with massive boulders that had obliterated a small village after an earthquake in the ‘70s. Very sad. 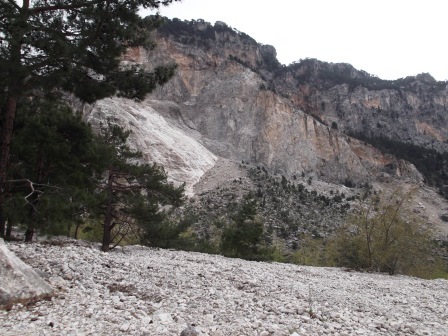 The side of the mountain that collapsed is still bare – a huge gash – and the erosion continues with rocks being washed down the new gulch. 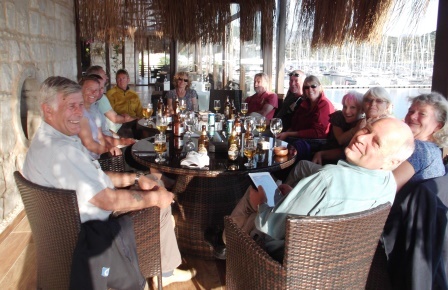 Unfortunately we had missed seeing our friend Pete who had been in Oludeniz for a week’s paragliding course on how to recover from bad situations – we just couldn’t get the time to meet up. We were almost ready to go – the foresail or genoa went to the sailmaker to be washed (although it looks no cleaner than before) and was put back up on a calm day. 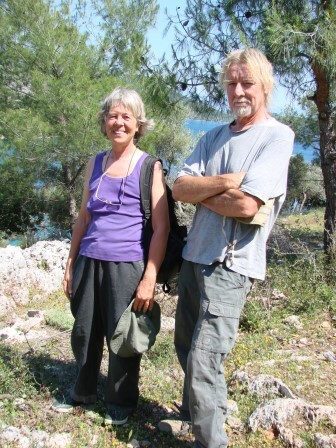 We had hoped to sail to Kekova for a couple of nights with Jeri and Curt but the weather forecast kept changing, with rain and no wind which wouldn’t have been very pleasant so that was abandoned. 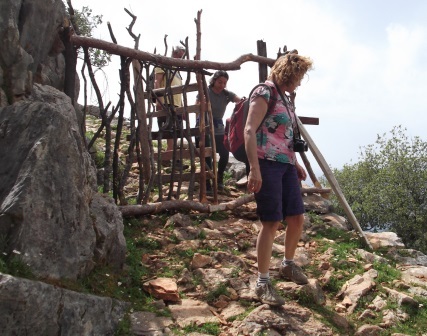 But the following week looked fine and we decided to leave Kas on Tuesday 23rd April. The night before we headed to the marina restaurant Meymekan for “happy hour” and to bid farewell to the gathered clan. We had returned the car after its sterling service, provisioned sufficiently for a week or more and donated a kilo of local biscuits to the marina office as a thank you. 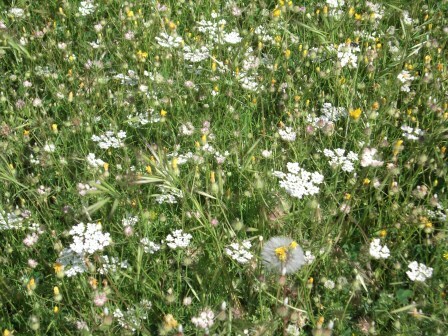 That week the weather cleared and the sun shone constantly – it was hot, hot, hot for the next two weeks. Swimming costumes were dusted off, shorts retrieved and summer clothing moved into daily wear. Winter clothes have been put away, and last week the duvet was ditched. Then it got cooler again! But summer is definitely just round the corner. Our first trip (motoring most of the way, but the sails helped a bit) was the long passage to Karacaoren where a restaurant has buoys in a small bay and provides a very good dinner. Then we headed into Gocek and Fethiye with a great sail across the bay, staying in our favourite Deep Bay for a couple of days, then down to Sarsala bay, had a walk up the hills around Sarsala through herds of sheep and goats. 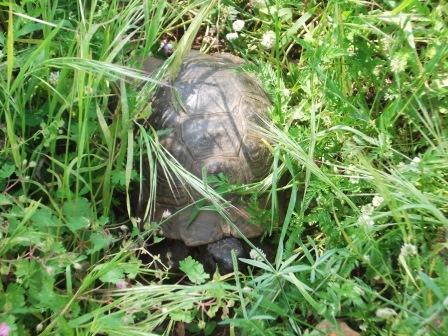 In Deep Bay we had a short walk round the olive grove at the end that was covered in a plethora of wild flowers, discovered a tortoise which looked very surprised at our presence, and Brian picked a speedwell for me. 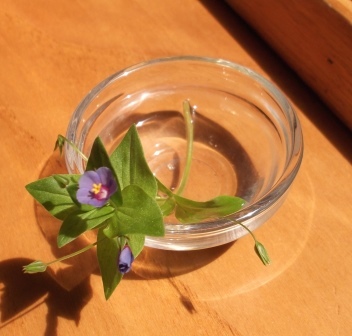 We put it in a small pot of water and it continued to open flowers for some days! Very pretty. Over the past couple of months we have seen a few migrating birds – swallows of course that also stay around here, and we have heard bee-eaters many times. Those elusive white spectacled bulbuls were around in Kas too. We saw what we think was a juvenile golden eagle on the walk around Sarsala – it came close enough that we could actually see the markings on its wings and it perched on a tree not very far away. A few skeins of geese or ducks have flapped their way north – much too far away to see what they were. I saw a couple of storks inland too – huge things. One day we noticed a large coastguard boat hovering about ½ a mile away. Its launch set out to pay a visit to several gulets on the other side of the bay. This took some time – then it came up to us. Oops, what did they want? They asked for our papers, including our sailing competence certificates. We have only been asked for them once before in all four years of sailing! Then a form was completed, I signed it and they left, saying that as our papers were in order they “didn’t need to damage your boat”. I was so flummoxed that I asked him to repeat what he had said! I later hypothesised that perhaps they meant “fine” rather than “damage”? As we were in the bays for a week, we headed out a couple of times to empty the holding tank, and had a great sail each time as the wind gave us a great beam reach on the way back. One day we went into Gocek itself, tying up to the municipal quay to reprovision, have showers and had dinner out at the Kebab Hospital (“we make kebabs better”). 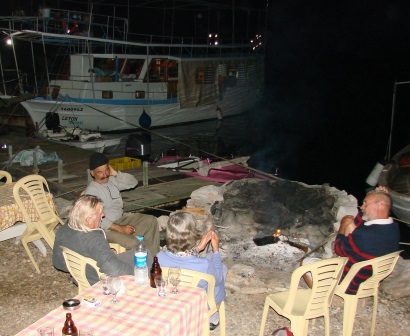 Petronella had been launched the previous week and were coming for a short stay in the Gocek area, so we arranged to meet them in 22 Fathom Bay the next day. Serious re-provisioning was needed, plus more visits to the chandlers of which there are many in Gocek. Thin cable to extend the new LED lighting to the cockpit was high on the list of requirements. The next day we headed down to 22 Fathom Bay, but naturally the radio that Brian had fixed earlier decided it wasn’t going to play. Fortunately we arrived before Petronella and managed to make faint contact with them on our handheld VHF as they approached. It was great to see them again – we admired their device for catching the buoys that are used to tie up to in these bays – and provided dinner, sitting outside in the cockpit as it was so warm. 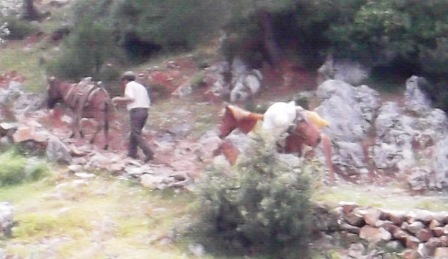 Brian and I had been watching eagles or buzzards flying over the cliffs, and a man with a horse and donkey laden with full bags going up and down the track in the valley. Both Petronella and we decided to stay in the same place the next day. Gill and John had previously been to Amigo’s Boat Restaurant at one end of the bay, so went over to arrange dinner for all of us that night. 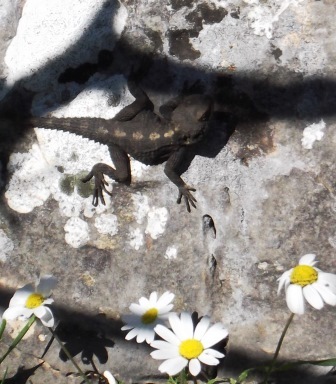 Gill has given me some of her photos, for which I thank her and they enliven this travelogue as you can see! Brian & I went on a long walk with Gill in the afternoon to the next inlet (Wall Bay) and visited an ancient ruin half submerged in the water. 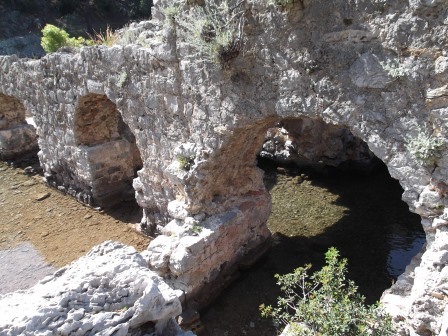 It is called Cleopatra’s Bath – she possibly stopped here at some stage, perhaps on her way to Bodrum? 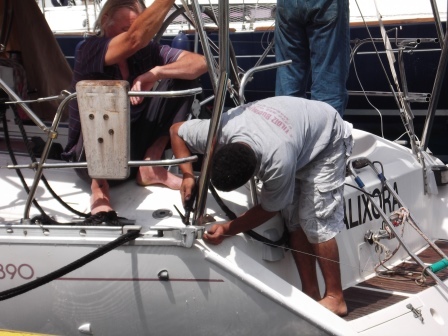 John had stayed on board to splice a thicker rope to the one they use with their cunning device to capture buoys – which doesn’t take a sufficiently heavy mooring line. 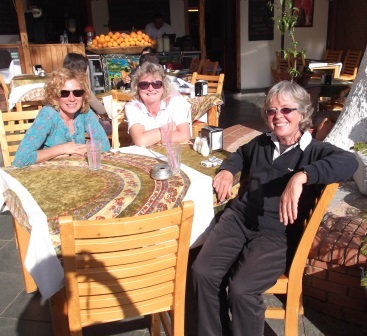 After tea with them, we returned to Alixora to prepare for a very pleasant evening out at the restaurant. We were served an excellent wild boar stew along with the usual starters which were very plentiful and almost filled us up before the main course! The restaurant owner, Gürol Duman, spent all evening regaling us with stories of the less salubrious events around the bay, as well as talking about his family (all of whom join him and his wife at the restaurant for the season) and enlightening us with other information. His son, Recep, operates a delivery service to the yachts moored around the bays, with bread, pancakes, fruit and baclava on his small but speedy (and bright pink) motor boat. He makes the bread himself. The night we were at the restaurant he took some other men out spearfishing (highly illegal in this area) so I don’t know what time he got back, and then had to be up at the crack of dawn to make his bread! I had recently read Louis de Bernieres’ novel “ Birds without Wings” about a fictitious village in the Fethiye area and its inhabitants at the beginning of the 20th century, when Mustapha Kemal Attaturk gained power, various wars were waged and the Greeks were expelled. I was interested to know how people selected a “surname” which they had not had prior to this time. Gürol said that his grandfather had just selected the first name of his father – there were no particular rules about it. From another source I had also been surprised to find out that Kas itself and other small seaside towns had had no road access until the 1960’s. 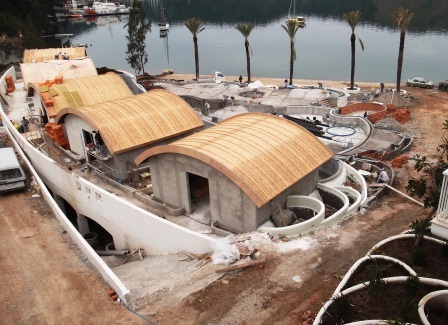 We needed to move on the next day towards Marmaris. A pleasant stop on the way was Kargi Koyu – where we had anchored last year with Jessica (my sister) and her husband Mark. We declined the offer of another boat trip to the ruins and marshes, but did a bit of beach combing instead, finding some more wood for the “shed”, some nice pebbles and some bits of foam that Brian thought might come in handy. Great rocky gulleys led down to the beach – the amount of runoff from the mountains behind must be extraordinary. The next day we upped anchor (finding that the windlass was still rather stiff, and that we had not unstuck some of the links on the new chain, so were hammering away for a few minutes) and followed the course I had plotted for Marmaris. Except that I had been very careless and just assumed the next major inlet was Marmaris. When we were approached by a motor launch full of armed uniformed men and were ordered to stop our engines I quickly realised my mistake! They did too, and as we turned briskly round they escorted us out of the military zone for a few minutes before heading back to base! If our VHF radio had been working we would have heard them warn us off. 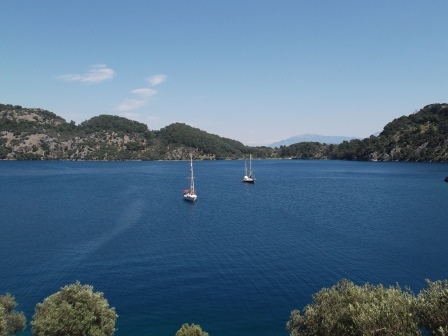 But I suspect it happens quite frequently – that bay does look a lot like Marmaris bay…..honest! So we were a bit late getting in to Marmaris, but were guided to a good spot near the supermarket and town. The next day Brian and I looked at other people’s solar panel arrays and the support design, did a bit more research on the web and finally drew what we thought was the best solution. A couple of companies that do stainless work had been recommended and were quickly on site to look at our design and suggest modifications. One gave us an estimate straight away – the other took a couple of days after a reminder or two. 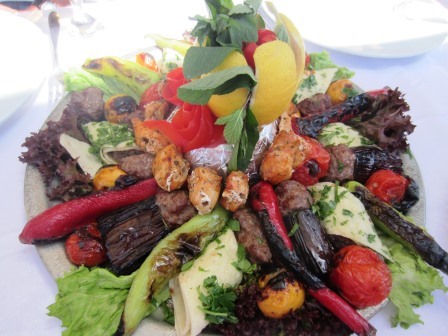 Kadioglu gave us a very good price and could do the work almost immediately so we decided to go with them. Yikes – bits of the boat have disappeared! Getting the solar panels was less easy – only because we are foreigners. 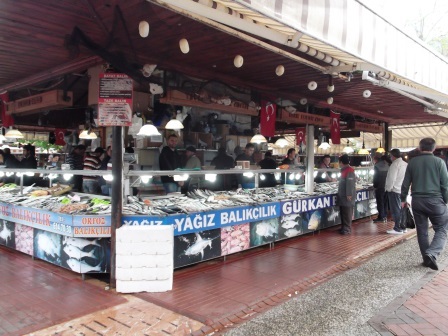 We got some prices from the local shops, but a Turkish friend of Gill and John got in touch to tell us about a good deal direct from the manufacturer – less than half the retail price. That particular make (Tera Solar) had been recommended by another British couple we had met in Gocek where we had admired their setup. I got a quote from Okan Bayer at Tera which was excellent and he was very helpful. We also needed another controller as the one for the wind generator wasn’t big enough, and they could sell us one of those too. Then it took another 10 emails and phone calls and numerous visits to the marina office to work out how to pay them! Initially a credit card payment document was sent by email to be filled in and faxed to them – but the payment failed at their end. Another card details were sent but that failed too! The UK bank responded that they had not received any requests, so it must have been the Turkish end with problems. Then I tried to pay by international bank transfer – but their bank branch wasn’t on the accepted list. So I guess this explained why the non-Turkish credit cards wouldn’t work if they weren’t on the international register. Finally I got one of the marina office people to speak to Okan asking if I could pay cash to their account through a branch of their bank in Marmaris. This was acceptable – so off I went (fortunately not too far, but it all involved a lot of trudging from one place to another) and finally managed to get the money transferred into their account. Phew. And that almost didn’t work as the bank clerk wasn’t sure if my temporary visitor residence permit and tax code (kimlik number) was permissible as proof of identity. After another 5 minute phone discussion it was accepted. And it cost me about £11 for the transaction – probably more than it would have cost for international bank transfer! Then we had confirmation that the panels had been sent off – 2 days delivery. Meantime I had to find out where we could have the gantry installed. Kadioglu had arrived on Friday saying they could do it the next day! We had to negotiate with the marina as they didn’t want it done where we were, so eventually agreed that Monday would be OK with everyone and they could find us a place. On Saturday I got a call in Turkish, where I caught the word Cargo – our delivery. Another scoot round to the office – the delivery van was outside – but it wasn’t our panels. The helpful office person again called the number that had called me – the panels needed to be collected from the depot. He was really nice and took me there in the marina truck, collected the panels for which I had to pay delivery (only about £9) and dropped them and me off at the end of the pontoon. I think by this stage he could see that I had steam coming out of my ears!! On Sunday we dismantled everything at the back of the boat. Undoing and lowering the wind generator was exciting – it landed with a bit of a bump but no harm done. Brian took the opportunity to Hammerite the rusty bits on the fin, and paint the body where sunlight had caused a few hairline cracks. On Monday we moved the boat to another bit of the marina. The guys arrived with all the bits at about 10am and spent all day cutting and remodelling the back of Alixora! It was a bit of a grey and rainy day, so I plied them with numerous cups of tea and biscuits. 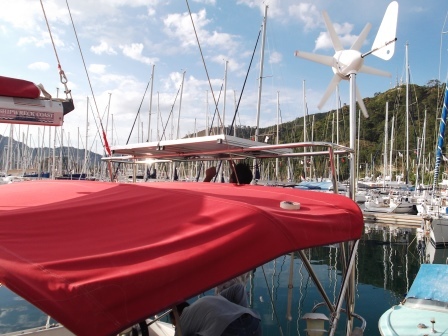 It was all finished by about 6pm including re-mounting the wind generator and putting up the panels, we were very happy, they were happy and we all returned to our various berths and workshops. The end product looks great! The very good installation guy has extended our pushpit a few inches so it all leans out a bit further at the back of the boat. More space for hanging our fenders etc. 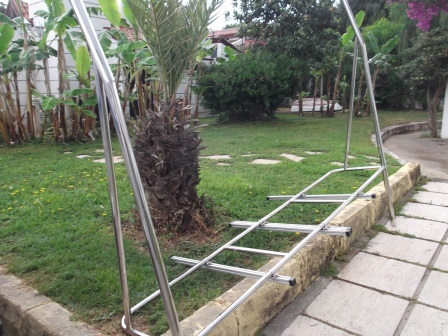 The extension pieces are welded invisibly in line with the original bars – we are impressed. And now we know what TIG welding is. The dirt and grit from the work has been washed away this morning, and now Brian is wiring it all up and I am getting to the end of this episode. We still have a few projects that need solutions (like mosquito nets for portholes that are mounted flush with the decking) and the davit for hauling the outboard up and down needs to be reinstalled somehow, but with our new electricity generating power we are really set for the next few months of cruising! So that is it for the time being. We will continue cruising north and slightly west according to wind and waves. 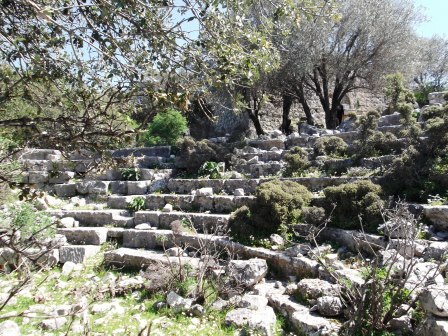 The next episode may include more old rocks if we managed to get to Ephesus!